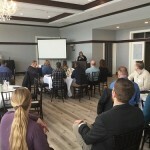 The 2019 State of the City address was given by Mayor Mary Fasbender on Wednesday, February 6th at the Hastings Pub House. The event was hosted by the Hastings Area Chamber of Commerce and featured a comprehensive video with a retrospective from City Department Heads, John Hinzman, Tom Bakken, Chris Jenkins, Chief Bryan Schafer and communications coordinator Lee Stoffel. One topic included in the Mayor’s speech addressed housing and how new terminology might re-frame the goal. Listen this weekend for our rebroadcast of the two part State of the City Address.